Allowing yourself to be inspired is key to being creative, whether professionally or as an amateur. But sometimes someone’s work can be so amazing that it leaps up a quantum state from inspiring to dispiriting, in that it’s so good you have no freaking idea how to even approach it. This holds even for silly things, like Looney Tunes. The more I look at them, the more impressed I become, and the farther away it seems from anything I could ever achieve. 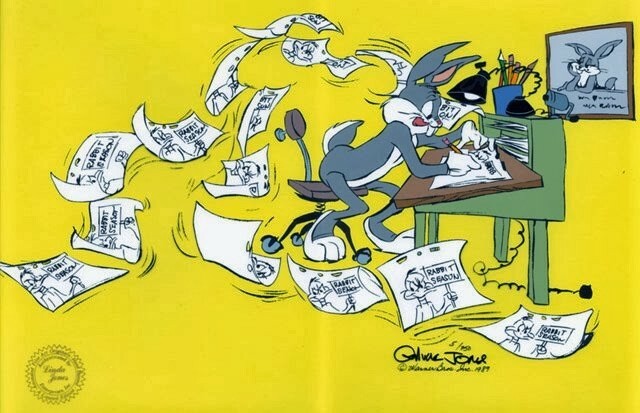 But in his memoir “Chuck Amuck”, Chuck Jones wrote about one process for creativity and collaboration that I have incorporated into my work, to pretty good effect: the “yes session”. The story sessions were not brainstorming, Jones said, not in the usual sense. Jones notes that there are many ways to say “no”, which he called a “cheap word”. Negatives can take the form of “I don’t like to criticize, but…” or “I don’t know” or “Jesus, really?” They all serve as roadblocks to creativity and exploration, though. I know this is tough. Believe me, I’ve seen plenty of stupid ideas and I’ve vociferously shot them down. This is, on balance, not to my credit. The alternative, Jones wrote, was that “then silence is proper”. This doesn’t mean accepting bad ideas, which Jones was well aware are plentiful (this isn’t self-esteem class, after all). Bad ideas won’t get support, and a team of creative people can’t resist moving on to something better. Of course, presenting to a resounding silence is also no fun, but this exercise is more about the people hearing – to prime them to create – then about the speaker. “The ‘yes’ session only lasts for two hours, but a person who can only say ‘no’ finds it an eternity. Negative-minded people have been known to finally inflate and burst with accumulated negatives and say something positive, because it is also true that a person who heretofore can only say ‘no’ is also a person who must say something.” — ibid. Try this in your next group critique. Experiment at various stages of the design process (Jones’ initial example was story sessions, but he also noted that they took time for “yes sessions” during the storyboarding phase). One thing to try in addition to this is setting time limits for speakers. Many facilitators will start sessions with letting people know that each speaker gets 30 seconds, or two minutes, or some set period. This speeds things up, and focuses thinking. And the thinking has to be towards “yes”. Give it a shot tomorrow. UX: If you know what you're doing, you are not the user. Journalism: If your mother says she loves you, get a second source. Insightful articles by UX designers and researchers of the UX Slack Community.